I'm climber from Moscow and going visit Praha next weekend. I'd be happy to have one day outdoor bouldering (Pethrograd?). What area do you advice? Thanks for your answer, Jirka! I'm a rock climber in Brazil. I will go to Praha next april and I look to local guide. I want to do a climb in a snow mountain or a little couse about ice climb. Who can help me? Hello everybody! I'm Matteo, maountain guide from Italy. I'd like to know some informations about ice climbing in your country. Who can help me? Try to look in the Links section here in Czechclimbing.com. Have you got somebody topo of boulders in Ostasz? 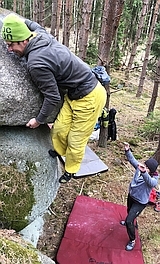 In general weather conditions for bouldering are not as bad in February but still the season starts usually in March. And Petrohrad is a great place to worn your finger tips. I've had very nice february day in Petrograd! So beautifull place, and ecxellent boulders!